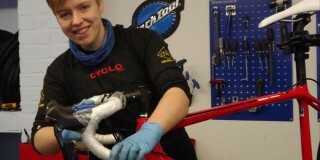 Skint Grainne can’t afford the airfare to see sister Charmaine tie the knot so she’s cycling over the Alps to get there instead Grainne Canavan cannot afford to fly to her step-sister’s wedding in Greece, but that is not ­stopping her, she’s cycling there instead. The 26-year-old feared she may not be able to make the 1,800-mile trip to see Charmaine Brenyah tie the knot on the island of Cephalonia because the air fares are too steep for her. But the keen cyclist accepted a challenge from her friends to ride there in time for the big day. And she has now mapped out a route that will take her from her home in Cardiff to Newhaven for a cross-channel ferry then through France, Switzerland, Italy and Greece. The trip will include a gruelling ride through the alps. Grainne, who plans to camp by the roadside on the 20-day journey, said: “I am a bit scared, but my legs are pretty strong and I’m sure I can do it. The Alps will be the hardest part. My sister thought I was crazy at first but she has come round to the idea and now thinks it lots of fun, as long as I make it there in one piece. 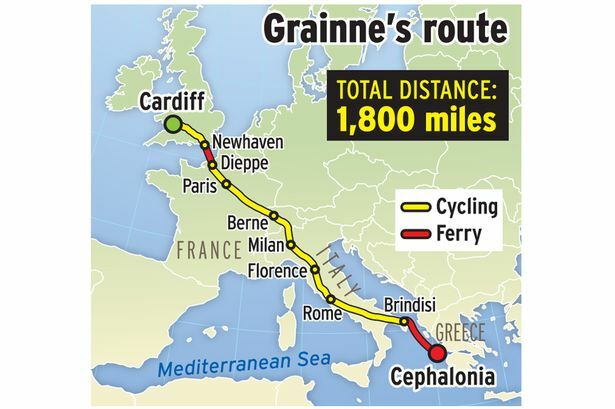 Grainne, who has cycled the 1,100 miles from Land’s End to John O’Groats, plans to arrive in Greece days before ­Charmaine’s wedding in June. She will flay back to Britain with her bike packed into boxes.